In Hawaii, growing anthurium flowers is a big business. Anthuriums are grown on more than two hundred commercial farms. Some of these farms have been in business since the 1950s, which was the decade that farmers first started growing anthuriums commercially. Keep reading and I will describe the techniques that these farms use to grow massive quantities of anthurium flowers. The first step in growing these flowers commercially is building a shade house. 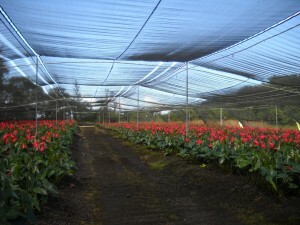 The purpose of the shade house is to provide shade to the plants that will be grown in it. The reason why shade is vital to growing anthuriums is that these plants would tend to get burned by the sun if they were to be grown in direct sunlight. To build a shade house, the parcel on which it is going to be built must be cleared and graded with a bulldozer. After the land is leveled off, galvanized pipes are set in place. These pipes are used as columns to support the cables and shade cloth that are used to construct the shade house. 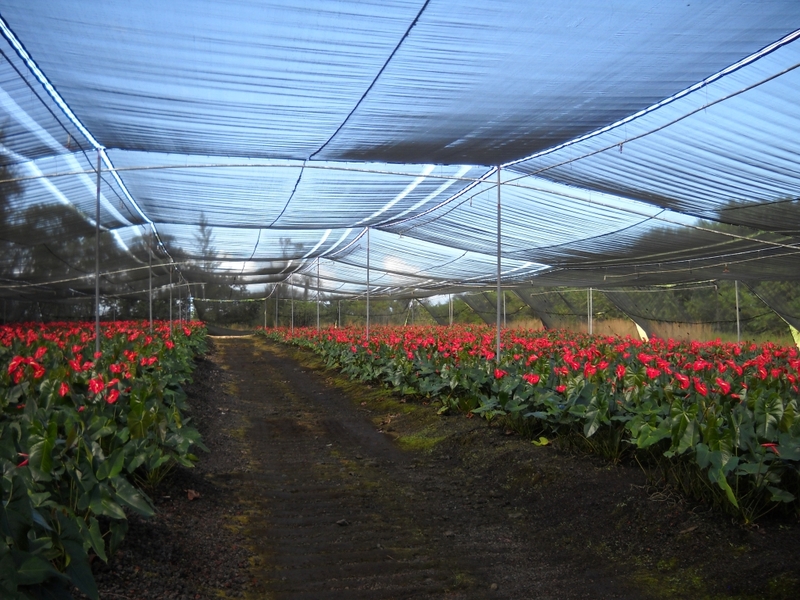 After the shade house is completed, volcanic cinder or other growing media is distributed on the ground of the shade house using tractors. The cinder normally comes from volcanic cinder cones and is brought to the farm in large dump trucks. Usually a layer of cinder about two feet thick is placed on the floor of the shade house. Once the cinder is in position, anthurium plants are acquired. They can originate from top cuttings of more mature plants in other parts of the farm or they can be the result of vegetative propagation. They are then planted in the shade house. Usually, Hawaii’s frequent rain showers provide enough moisture for the plants. But, when the rainfall is insufficient the anthurium plants may be watered through overhead sprinklers.